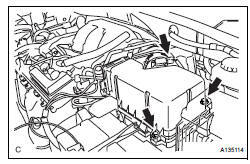 (A) disconnect the 3 vacuum hoses. (b) Remove the No. 2 ventilation hose and air cleaner hose band. 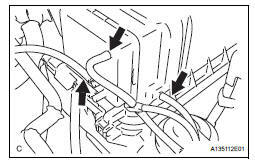 (c) Disconnect the vacuum hose (EVAP) from the air cleaner hose. (d) Disconnect the mass air flow meter connector. (e) Remove the 2 bolts and air cleaner cap subassembly. 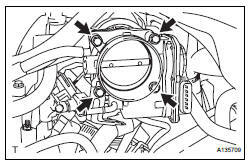 (a) Disconnect the throttle body connector and clamp. 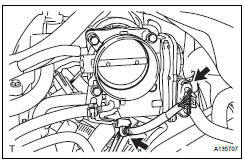 (b) Disconnect the 2 water by-pass hoses from the throttle body. 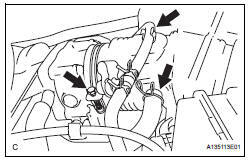 (c) Remove the 4 bolts and throttle body. 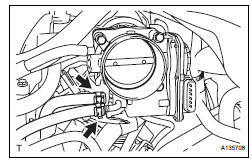 (d) Remove the throttle body gasket from the intake air surge tank.